How Ready Are Canadians for Driverless Cars? > How Ready Are Canadians for Driverless Cars? It may sound like the stuff from a science fiction novel, but self-driving cars may well soon be a reality. In fact, many of today's new cars already have features that came about as a result of the drive to develop autonomous vehicles: front crash prevention, adaptive cruise control, lane departure warning, blind spot detection, and park assist to name just a few. And this month, at the Consumer Electronics Show (CES) in Las Vegas, Nevada you can be sure there will be a lot of discussion about the future of driving. As the reality of driverless cars on our roads accelerates, Kanetix.ca has released new survey findings of Canadians' attitudes on the (not so) futuristic vehicles. One in four Canadians (26 per cent) are excited at the prospect of driverless cars, while 18 per cent (down from 23 per cent the previous year) say no thanks, they love driving too much to give it up. But for the most part, Canadians are hesitant, with 56 per cent saying it would depend on the autonomous technology and how well it works before they make a decision. While 26 per cent of Canadians can't wait to sit back and enjoy the ride of an autonomous vehicle, some drivers are more keen than others. 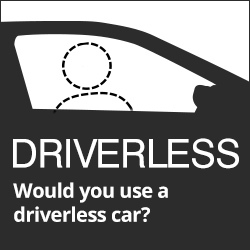 Men: 28 per cent of men said they can't wait for the day driverless cars become available. Youth: 36 per cent of drivers, aged 18-34, said the future couldn't arrive soon enough. La Belle Province: Quebecers are the most eager to embrace the technology (30 per cent). Yet, despite being widely anticipated, Canadians in general agree that it will be years before self-driving vehicles are available to the public. Overwhelmingly, 80 per cent believe it will be at least 15 years, if not more, before they'll be able to get behind the wheel of a driverless car. Ready or Not, Canadians Have Faith That Autonomous Vehicles Will Make Our Lives Better. 81% believe the threat of distracted driving will be eliminated. 73% think collisions and auto-related fatalities will be reduced. 68% have confidence that pedestrian and cyclist safety will increase. 66% expect that pollution and automobile emissions will be reduced. 64% think the overall driving experience will improve. Despite all the good that Canadians think will come out of self-driving cars, one thing we don't expect autonomous vehicles to improve is traffic: more than half (54 per cent) of Canadians think traffic will be unaffected regardless of who-or what-is driving the car. Self-driving cars may not yet be a reality on the roads, but many newer model cars have safety features that incorporate a certain degree of automation. And these features, specifically Automatic Emergency Braking (AEB), have caught the attention of auto insurers. Aviva Canada, for example, recently announced that drivers of vehicles equipped with AEB will be eligible to receive a 15 per cent auto insurance discount. While Aviva is the first to offer an AEB discount, it's expected that more insurers will follow. Fully self-driving cars may be years away, but there's no time like the present to save money on your auto insurance. Compare auto insurance quotes to see if you could be getting a better rate today.